Each year Pi ( ) day happens on the 14th March, allowing people throughout the world to celebrate this most special of numbers. This date of (3.14) was chosen because it can be written as the first three digits of Pi when using the standard U.S. convention of (month/date). This year we will celebrate Pi day by looking at the life of Ludolph van Ceulen (1540-1610), a mathematician and fencing teacher who spent around 25 years of his life calculating Pi to 35 decimal places. Nowadays we can just type Pi into Google and get it to as many decimal places as we could ever want or need. What is easy to forget is that many people have spent huge amounts of energy and time in calculating the digits of Pi. The current world record (November 2016) for calculating the digits of Pi stands at over 22 trillion digits, with the calculation having been done on a supercomputer. What is impressive about Ludolph van Ceulen is that he did all his calculations by hand. This is why it took him 25 years to arrive at his record-breaking 35 digits. How many digits of Pi are actually useful? Engineers and scientists use Pi all the time. What might surprise you is that they don’t actually need many digits of Pi in order to make accurate calculations. NASA say that they only need to use Pi to an accuracy of 16 digits: 3.141592653589793, even for their most complicated space missions. In reality most engineers use an even less accurate approximation to Pi. When Ludolph van Ceulen calculated 35 digits, he had already exceeded the number we will ever practically need! Why keep calculating more and more digits of Pi? Throughout history people like Ludolph van Ceulen have fallen in love with Pi and devoted themselves to its study. The investigation of Pi has also resulted in the discovery of lots of new mathematical methods as people have competed to find the best and most efficient mathematical way of calculating Pi. Ludolph van Ceulen was born in 1540 in Germany, but spent most of his life living in the Netherlands. He was the son of a merchant and was too poor to go to University. This meant that he couldn’t learn Latin or Greek, which was a big disadvantage because most academic writing was done in those languages. Despite these setbacks, Ludolph made a good living teaching fencing, and also managed to learn mathematics. Ludolph couldn’t read mathematical texts for himself, but in 1586 his friend translated Archimedes’ Approximation of Pi. This must have made a big impression on Ludolph as he spent the next 25 years of his life improving on this approximation. Archimedes had a clever way of approximating Pi. 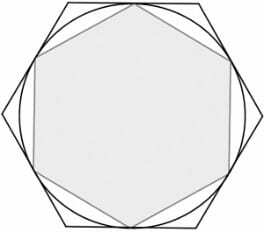 He inscribed a hexagon inside a circle and also circumscribed another hexagon outside the same circle. He then calculated perimeters and diameters for both these hexagons, leading to an upper and lower bound for Pi. Ludolph van Ceulen used Archimedes’ methods and extended them to working with a polygon which had . This produced a 35 digit approximation of Pi and took 25 years of calculations which were done by hand. For the last 10 years of his life, Ludolph van Ceulen was able to teach both fencing and mathematics in the same building. You might imagine that Ludolph van Ceulen was a recluse who hid himself away calculating the digits of Pi. To the contrary – he must have been a dynamic and lively individual who loved both fencing and mathematics in equal measure. Ludolph’s achievement was so great that when he died, his upper and lower bounds for Pi were inscribed on his tombstone. Unfortunately the tomb later disappeared, however a replica has now been made. Ludolph van Ceulen only managed to publish Pi to 20 decimal places within his lifetime, however the full 35 places were published after his death. His work was so important that for many years Germans even called Pi the ‘Ludolphine Number’.